I have been working on another project lately, that is not Crazy Quilting. 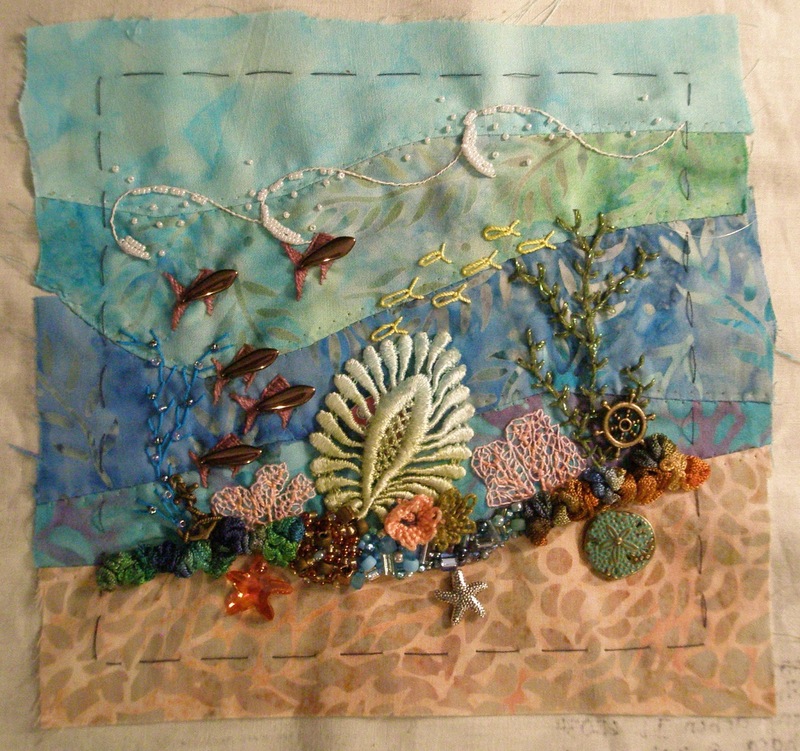 I am continuing to enjoy the Round Robins at Crazy Quilt International, but I have started the work on a major hand stitched project. 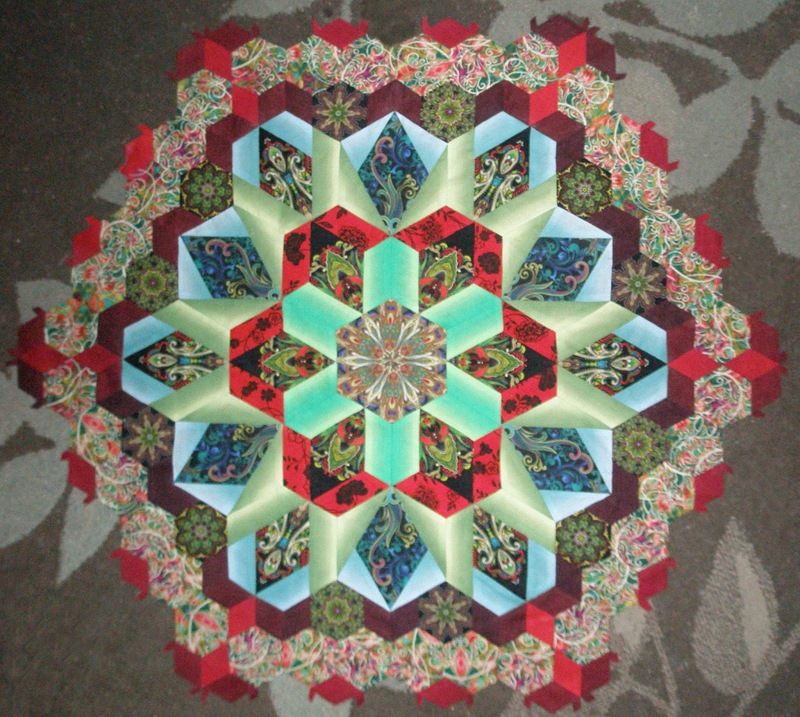 My adventure into English Paper Piecing started in February 2016 and I am putting together a quilt, following the New Hexagon Quilt along on Facebook. 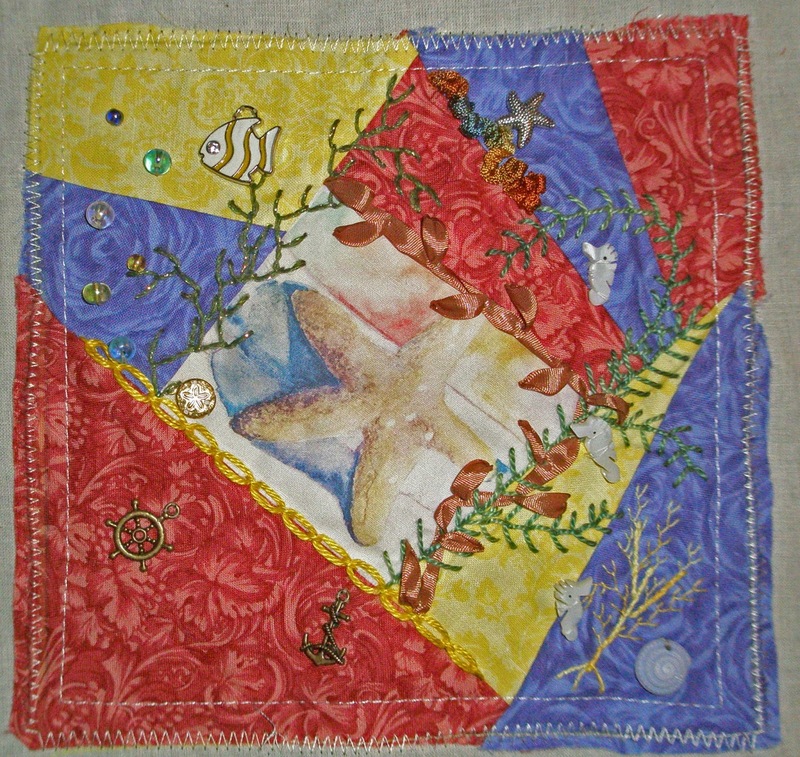 This has been an adventure, and I am working Round Robin Crazy Quilt Blocks and then this project. So, things are moving along slowly, but the are interesting. 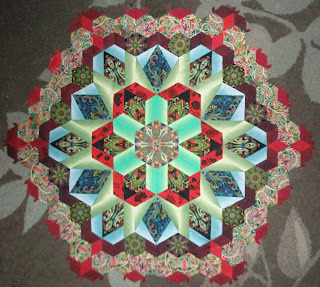 And the Rosette #4 that I finished this morning. 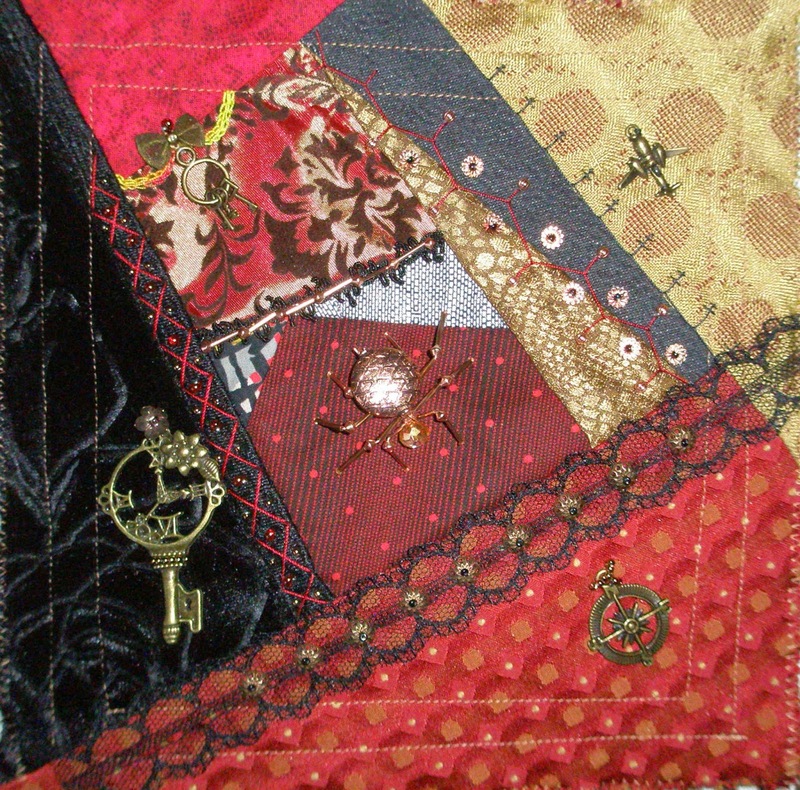 Now I have a Crazy Quilt Round Robin to start on, but While I wait for that to start, I will be cutting out the fabrics for Rosette #5. I think it will be green, but not sure at this time. We'll see how it goes. 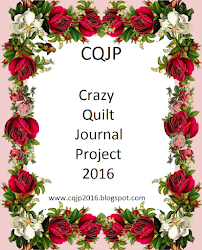 I have been so busy with the CQI Retreat, two Round Robins and working on a New Hexagon Millefiore Quilt, that I have neglected this blog. Wow, did not realize how long it has been. I do have my blocks made for the Under the Sea (UTS) Round Robin (RR) where we Do Your Own Blocks (DYOB) which starts January 15, 2016. This is a Crazy Quilt International (CQI) RR. 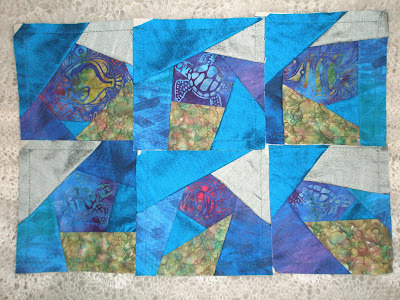 So, using some Dupioni Silk, Satins and Batik fabrics, I have my blocks ready for the ladies to work on. 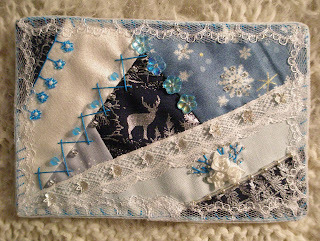 Winter Postcards for the Crazy Quilt International (CQI) Christmas/Winter Postcard Exchange. 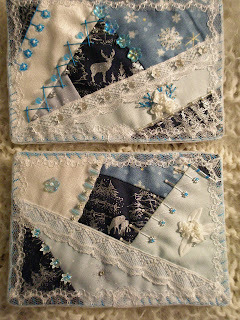 I asked to exchange two (2) Winter postcards, as these are my Winter and Christmas colors. 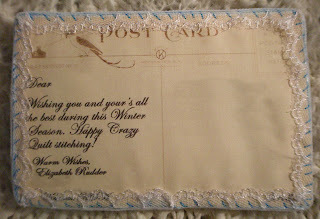 And I so want to display the lovely cards I receive in return for my cards. 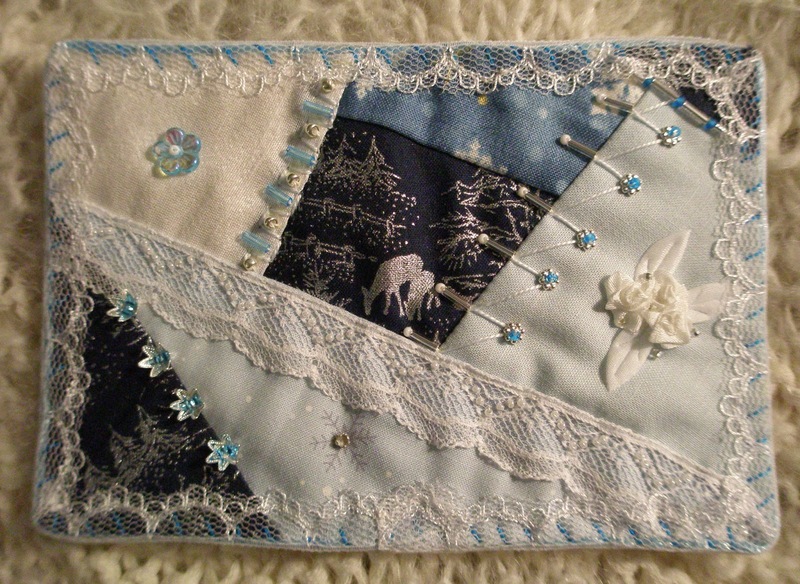 I first crazy quilted the fabric pieces on the 6inch muslin and batting pieces. Then I added the hand embroidery and beads. Once the CQ block was embellished, I cut it to the 6 inch x 4 inch Postcard size. I used Temtex as the Postcard support. 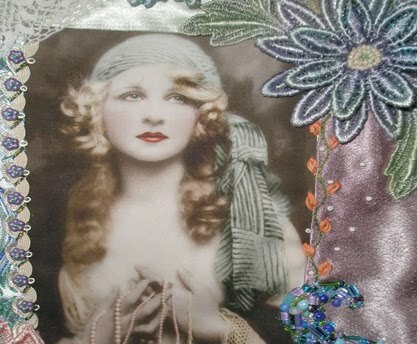 On the Message side, I scanned some postcards into my computer and used Photoshop to clean up any imperfections on the Vintage Postcards I had in my stash. Once cleaned, I added the Message and addressed each postcard to it's recipient. I have Removed the recipients' addresses and names from these photos, for privacy. The Postcards with messages were printed on fabric and cut to size. I placed a small light Blue Rat-tail trim around the edge and whip stitched it down to the front & back of the Postcard. And finished up with a double edged 1inch lace over the edges. I used pins to hold sides together while stitching, no glue or adhesives were used. 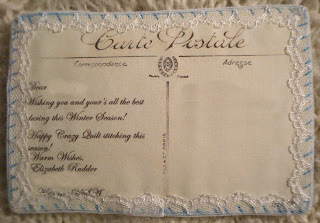 Today I finished Colleen's block for the Steampunk DYOB (do your own block) RR (Round Robin). I enjoy Steampunk, but admit I lean a little more to the Victorian than to the Industrial side of Steampunk. When I received Colleen's blocks, I struggled with which of the 5 blocks I was going to work. It took a while, but I decided on one with larger spaces for the items I was going to use. 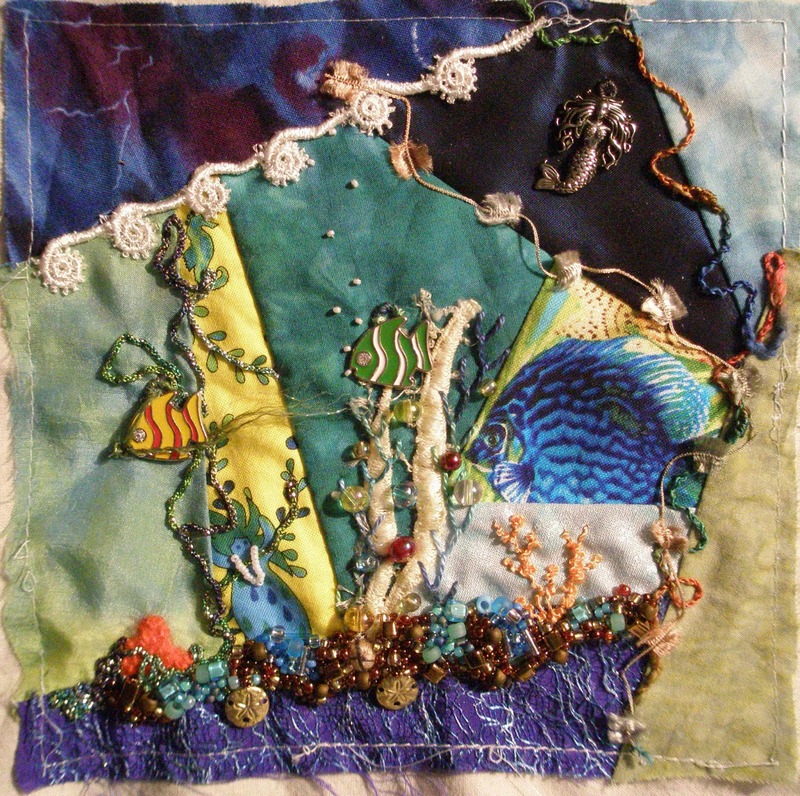 I first used a Gloriana Princess Petite Perle in Red, on the black velvet fabric to the left. I did an X stitch (it is not the Herringbone) and then added the Bronze/Red beads to the center of the X's. On the outside of the X's, I used size 11 bronze seed beads. Next was the Cretan Stitch in the same Gloriana thread, but this time I used a corrugated 3mm copper bead and added it to the top of each upward and downward stitch. The 5mm bead caps are stitched to the block using a Nymo thread and a 3mm copper bead. the Victorian in contrast to the Industrial. I individually stitched all bead on the project, so that if needed, Colleen could remove the single bead or set when stitching blocks together. I used 6mm Bronze filigree bead caps and size 11 black seed beads on the center line of the Lace. I love beading, so anyone in a RR with me is for warned, I will use beads. LOL! Black Loop Lace, also in my Etsy Shop, is used in the center and I used 3mm Copper Diamond shaped beads and copper tube beads over the top of the lace. These were stitch as a group as there would be no need to remove them for construction. 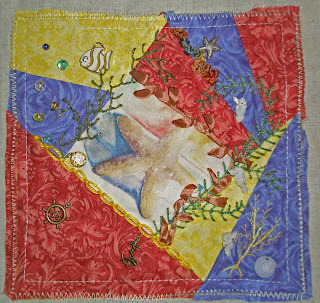 I used a lovely variegated yellow and red from Loraine's Etsy Shop on the red fabric at the top of the block, to carry the gold to the center and right side of block. Chain stitch was used to make to drapes across the seam and added a tiny Metal mesh bow and bronze key ring. The telephone poles were made using the Gloriana thread in charcoal and I added the bronze airplane for that industrial and flight feel. A bronze key with flowers and a watch face in the center was then added. I did use a Bronze bead cap with a size 6 bead in the center to hold the top in place. To secure the bottom of the key and to keep it from moving, I used 3mm bronze seed beads around the key just under the clock face, it added a nice touch while adding security to the key. The Mariner's Compass was attached to block using 3 strands of size 11 seed beads in bronze. Lastly, came the Spider in the center. This took some doing. I knew I wanted to add a spider, but I also knew I wanted it to be of metal, like an automaton. So, I found the 18mm center copper bead, a golden 6mm bead the diamond shaped copper 3mm beads and the copper tube beads and attached them to the front and back of the spider with copper Head pins. The four center legs were made with antiqued copper twisted square 13x 1.2mm tubes and the diamond shaped copper 3mm beads held together with the copper Head pins and attached to the construction portion of the first two sets of legs. Then stitched down with a monofilament thread to the block. And that's it! I like it, and I hope Colleen likes it as well. It snowed last night, our first snow of the 2014 Winter. 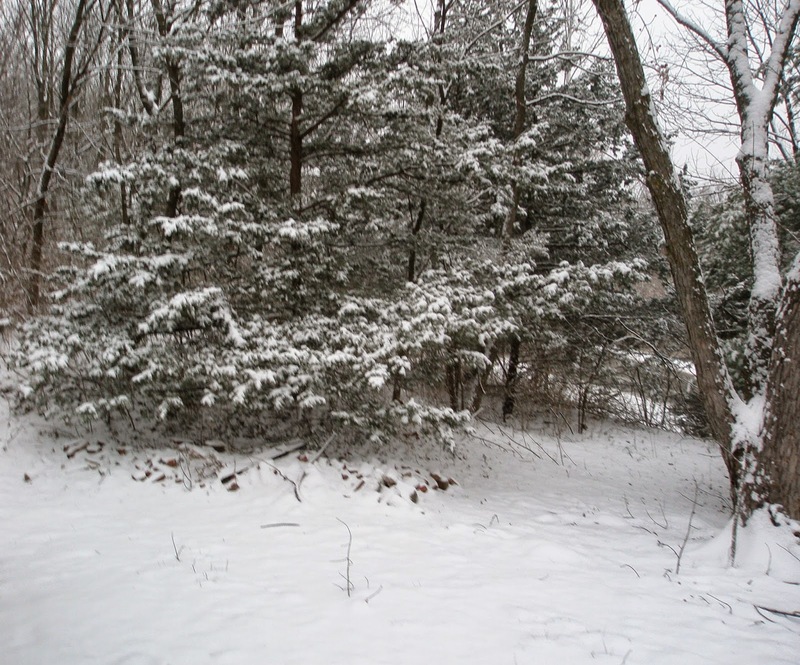 It is just a little over an inch of snow, and that may seem minor to some, but for a gal that grew up in the Los Angeles California area, it is major to see the snow fall and have it laying on the ground. LOL! It is still snowing, but will end soon and then I will have to go back to knitting and working on Crazy Quilt Blocks. I just never get enough of watching it snow. Guess I'm just a kid at heart. Lucky me!